The image below our header symbolizes the coming together as a nation during World War I to recognize the brave fallen soldiers of all wars. Memorial Day for many Americans, represents a relaxing, fun-filled three-day weekend at the start of summer. It’s a day to Bar-B-Q in the backyard, go to the beach, play with the kids, go to a theme park, maybe go to a parade, or enjoy family time. However, the true significance of this national holiday has been lost by many Americans. 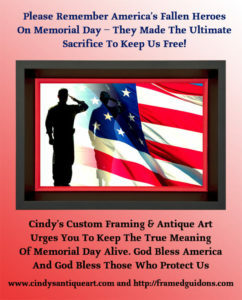 Memorial Day’s origination is based on somber events that were set in motion by internal conflict nearly 150 years ago. America celebrates Memorial Day much differently now than it did a century-and-a-half ago. This is because so much time has passed since its origination. And it is also because the majority of Americans are not fans of history. For these reasons, the true meaning of Memorial Day has been lost by many Americans. 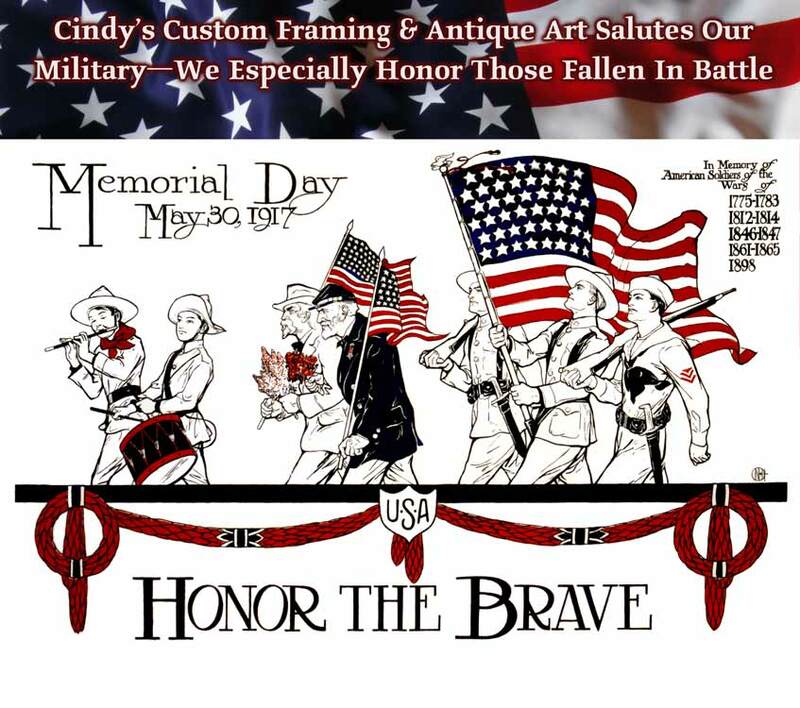 So, we wish to remind everyone that Memorial Day originated as a day to honor and show respect for America’s fallen servicemen and women – brave men and women who died defending America. America celebrates a number of military or patriotic national holidays. These include George Washington’s Birthday, Memorial Day, Independence Day, and Veterans Day. However, Memorial Day is the most solemn and somber of all federal holidays. Memorial Day is a national tribute to the brave men and women who never returned to their families from war. 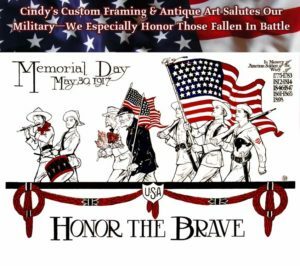 Tragically, Memorial Day originated as a result of the greatest conflict in our history– the “Great Rebellion” as Northern Forces called it or the “War Of Southern Independence” as the South called it. The great conflict that split America apart is known today as the “Civil War”. Memorial Day originated as a result of the Civil War. According to Wikipedia, its origination is credited to General John Logan, national commander of the Grand Army of the Republic. He receives credit for initiating it because of his proclamation on May 5, 1868 to clean up the graves and place flowers on the graves of the men who had died defending the nation against the “Great Rebellion” by the South. Initially, the day was called “Decoration Day.” The reason it was called “Decoration Day” is because volunteers spread out across the nation to lay flowers and clean up the grave sites of fallen Civil War soldiers. The death toll for both the North and the South during the Civil War was horrific. Every town and every city suffered the loss of someone. The total loss of American lives (on both sides) during the American Civil War is estimated to be 750,000 from both combat and other deaths. To put things into perspective, this represents a casualty rate of 2.385% of the population. So at that time, for every thousand Americans living, nearly 24 died in the Civil War. Click here for the casualty rates for all American Conflicts posted in Wikipedia. After the Civil War, the South remembered their fallen as well. They held similar grave cleanups, presented flowers, and draped flags over the graves. Each state in the South celebrated a remembrance day. Unfortunately, the bitterness between the North and the South existed for decades. Even to this day, Southern states still celebrate “Confederate Memorial Day”. However, after World War I, the nation began celebrating Memorial Day to commemorate or remember servicemen and women who had fallen in all wars. We use the World War I campaign poster above as a reminder that everyone came together as a nation during World War I. In that poster, it depicts veterans from the North and South together carrying flowers to decorate graves. 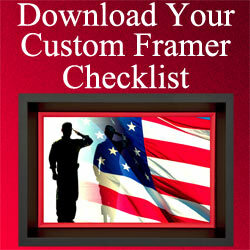 As custom picture framers with a large military customer base, we are proud of our work. 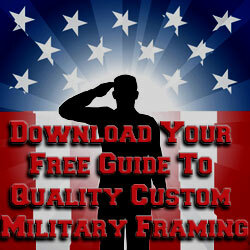 We are also eager to display examples of completed military framing projects on our websites. However, we are sensitive to some of the completed projects entrusted to us. Occasionally, we custom frame personal items reflecting the sobriety of the human tragedy associated with losing a family member in combat. These completed projects contain items that are personal which we will not display. We mention this because we see the human cost of sacrifice that military families endure. Their loss is obvious, no matter how brave a widow or family member tries to appear. We see their hurt when they bring us mementos to frame as a remembrance to their husband or loved one. We have the utmost respect for the surviving family members. And we wish to honor their fallen family members by remembering their sacrifice on Memorial Day. The reason we mention the cost of human sacrifice is because most Americans are unaware of the cost—the high price of freedom. In some cases, people are totally unaware of the sacrifice that men and women continue to make in the name of American freedom—because they are so far removed from seeing or knowing a casualty of war. Speaking from a personal point-of-view, we live in a military community that provides us with a strong military customer base. 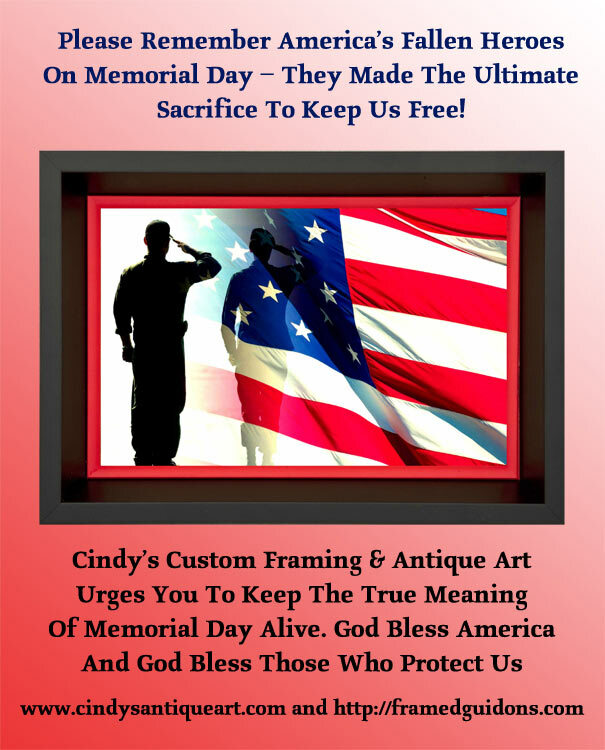 For us, we consider it a true honor to be a military framer—providing custom picture framing services for active duty and retired military personal. Seeing our military men and women serve proudly throughout the community is our motivation for encouraging the remembrance of fallen servicemen and servicewomen. And we keep our head high with the pride of knowing as Americans there are brave men and women willing to sacrifice their lives to keep us free. Memorial Day is a bittersweet holiday. We have fun with our families and we take travel and freedoms for granted. However, the freedoms we have, and the pleasures we take for granted are attributable to the sacrifices the members of the military have made on our behalf. The sacrifice that enables us to enjoy the American life is a result of many wars. It began with the American Revolution and continues to this day. As of this date, a staggering 2,893,818+ Americans have been killed, wounded, and are missing in action. That staggering number of nearly 3 million people is the price it has taken to keep us free. Realizing this huge sacrifice is the reason we encourage our readers and our website visitors to remember the true meaning of Memorial Day. It is a day to remember our fallen servicemen and women, who have died defending this nation to keep it free. God bless our troops and God bless America!